While visiting Pubs there sometimes comes up a question or point of Pub history that causes the collective grey matter in the Public Bar into a state of debate. Best we can do is offer to put the question onto the Gday Pubs site and say that if someone knows then we will pass it on to the Boys at the Bar. So if you can solve any of these, please email us. If you have a question that does the rounds in your Pub and you would like to post it here, please email us also. Someone may have an answer. I hope this finds you well. I was speaking with my husband about possible reasons for pubs having PUB written on their roof tops. We came up with a couple of theories but couldn't find any literature to support any of our theories. Any chance you could shed some light? 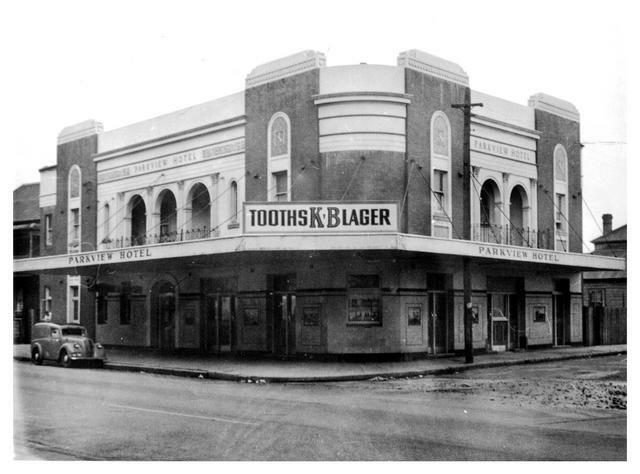 Hi John, I have consulted my book "One For The Raod" A History of Tamworth's Hotels and the photo shown on the G'Day Pubs site is definitely not the Post Office Hotel in Tamworth. A 1975 photo shows ten verandah posts along the front and much closer together than those in the photo on the G'Day site. There is no mention of a publican name Kerr. Will see if I can spot any possibles in my collection. 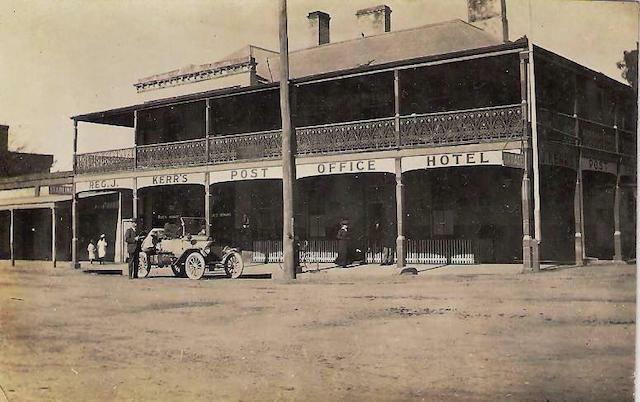 "Hi ,My Dad found this photo dated about 1920 and we were curious about the location of Reg,J.Kerr's Post Office Hotel. The Model T Ford in the photo was on a demonstration tour to rural Australia extolling the virtue's of being able to convert the T to the Eros Mak-a-tractor. "Does the work of 4 strong draught horses. "The person standing alongside the T is my grandfather who was part of the demonstration and sales team. 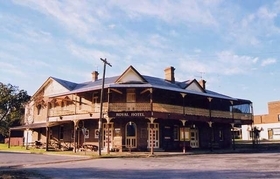 We were wondering if the location can be identified, there are quite a few Post Office Hotels in Australia and I have looked at quite a few in NSW and Qld but have not been able to spot any locations that look similar. I must admit it was fun looking for the locations on your site and when I have more time I will do some more exploring. Regards, Peter"
Hopefully someone will recognise, - Ed. Photo courtesy Peter Goodman, Many Thanks"
Amongst some very old negatives that have come to light in a box is one of a hotel. Unfortunately the name is not in the negative. But on the top of the building is the name M V NOLAN. The photo/negative looks to be about the 1920’s judging by the cars parked at the front. Can you please let me know, if indeed you can find out, where this hotel is located, or was located. I have encountered two apparent uses for the phrase "pub debate." One seems to refer to public debate, while the other refers to debate in a Pub. I wonder whether both origins are actually related, and also whether one is more "correct." All opinions would be welcome. Thanks J. Interested to see what sort of response you get. I can help by confusing things even more.. What if "Pub Debate" refered originally to debates in the Public Bar of a Pub, whereas a debate in a different part of the Pub may have been a "Saloon Debate" in a Pub in Public. arrgh brain fade. ed. 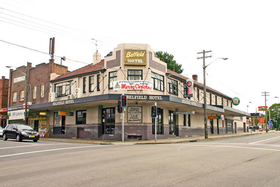 "I have been researching my Family History and found my Uncle (Gordon Fitzroy Woodlands) was listed in the 1933 & 1936 Electoral Rolls as Licensee of the Baden Powell Hotel. Do you have any records to confirm this and if you had any other information, it would be appreciated." Graeme. Thanks Graeme will pass on any info that is sent in. I am looking for the following two pubs that were operable in 1902; they were the 'Club House Hotel' and the "Great Western Hotel'. The reason for my enquiry is that my great grand Uncle Maurice John Lee was the publican in both pubs, not at the same time. There is a very sad tale to tell about his demise, after returning from the Boer War with typhoid and going to Cowra to recuperate and be with his sisters, he was shot dead in the Club House Hotel by a woman when he refused to marry her in 1902. There is so much written about the whole sordid affair throughout Australia and New Zealand. I have looked at your web site and of course the pubs are not called by those names - do you know if they are still around and if so what are they called now? You might find this fanciful but I had a very realistic dream that in the cellar of one of these pubs is a small rusty tin box under a whole lot of rubbish and inside are lots of personal details on Maurice John Lee, more often he preferred to be called John rather than Maurice (actually don't blame him)! My dream was so strong I am very curious to say the least. Many of these country pubs kept on their walls a great deal of historical memorabilia so if there is anything about Maurice 'hanging' around I would be most grateful. If you want to know the full story and history, just look up TROVE Newspapers either under Maurice John Lee and/or Ethel Herringe. There are heaps of articles regarding the subject matter. By the way, there are still members of the Herringe family living in Cowra today." Centennial Hotel Gulgong / History ?? "Dear G Day Pubs , Can anyone provide details of this Country Pub , such as former Licensees that may include one of our McManus Family ,but not sure of the time line . Many thanks Norman Field / Wollongong area "
"Hi. Do you know if the Albert View Hotel is still standing? 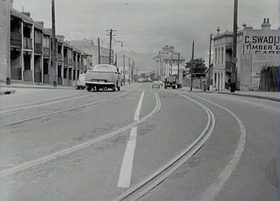 It was located at the corner of Redfern and Walker street in Redfern. My great grandfather’s brother owned or was publican of the Albert View from around 1894 to 1914 (not exactly sure of the time frame). Do you know where I can find out more of its history? Any info appreciated, Cheers, Chris Stewart"
Looking at streetview there is no hotel building at that intersection now. Will post a blog and see what response we get. We also have a number of general books about sydney pubs so will have a look through and see what I can find. Other than that there is the state library or local historical associations. 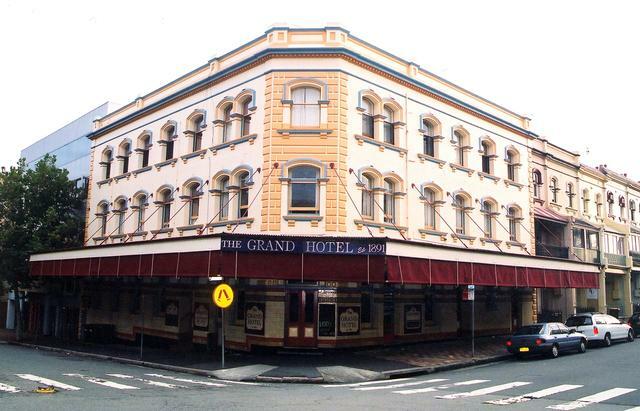 "I think your site is great I am looking for the name of a hotel on Quay Street Sydney. It was between the First and Last and the Ship Inn can you help please. Thanks Vicki , hopefully someone knows and will let us know. "The Baden Powell Hotel was situated on the corner of Regent and James Streets, Redfern NSW 2016. I had a few beers there over the years. The pub closed as a pub in 1970’s – 1980’s. I used to drive past the pub on my way to work every morning, saying to myself “I must take a photo of the pub before it goes.” That never happened. The hotel was demolished overnight in the late 1980’s. I stand corrected on these dates." Thanks Jon - Does anyone have a photo of the Pub before it was torn down?? Enquiring about the name of a Pub on the corner of King & York Street in the late 70s diagonal to the Forbes Hotel and opposite The Grace Hotel. 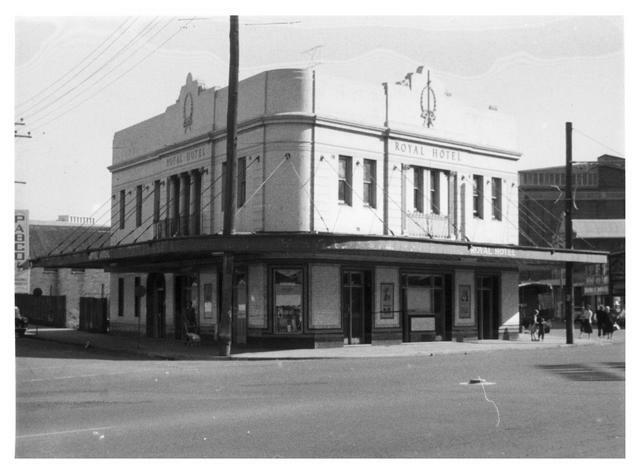 This pub is now called the CBD pub, any info would be great. As it is racking my brain the owner of the pub said it used to be a book shop, and before that a bank, but before the bank it was a Pub I used to drink at in the late 70s. Good question Debra, Jon thinks it was a pub in the 70's as well. Looking into it. "Hi there, came across your site looking for information about the Native Youth Hotel, Pyrmont. My great great grandfather Thomas O’Brien was the publication of this Hotel till his death in 1875, but I thought he was there earlier than you have in your information on this Hotel. Perhaps it was a private Hotel before that date. Will see what we can find out. I have always been told that my great grandfather Enoch Heath used to own a Hotel in Dudley...He came out to Australia from England on "La Hogue" ship with his wife Annie nee.Gibbs and their seven children...they were to have four more in Australia. They came out to Australia in October, 1878. Is there any way I could find out if they owned the pub. I have a very old picture of the pub and I think it matches the Ocean View Pub. My picture has a paddington lace verandah across the front of the Pub. Would be greatful of any information at all. This is the photo I have of the Hotel many years ago. It may not show anything it is very old." Does anyone have any information, thanks heaps. The old photo of the Pub below is named The Enoch Heath Hotel, So that may have been an early name. Just to let you know I found a photo of my GGGrandfather on your website. A relative of mine had in some family history notes that Enoch Heath ran a pub in Dudley (Newcastle). When I was searching I found Gdaypubs and lo and behold there he was and the Ocean View Hotel. The first time I have seen a photo of him. Most excited. I can’t wait to show my Mum and other family members. Next time I’m in Newcastle I’ll be sure to have a drink there. My name is Terry, I'm a chef in a pub called the River Royal Inn formerly the Royal Hotel in Morpeth NSW. I am trying to do a pictorial history of the pub for our guests & am having trouble finding information. Any help you could offer in the way of resources ie weblinks etc. would be much appreciated. Things get quiet interesting when one takes a straight line from Tweed Heads & then take into account that the border line heading south east to Mungindi. Thanks , there's good question right there. I will put up on Gday Pubs and see what opinions we get back on this. 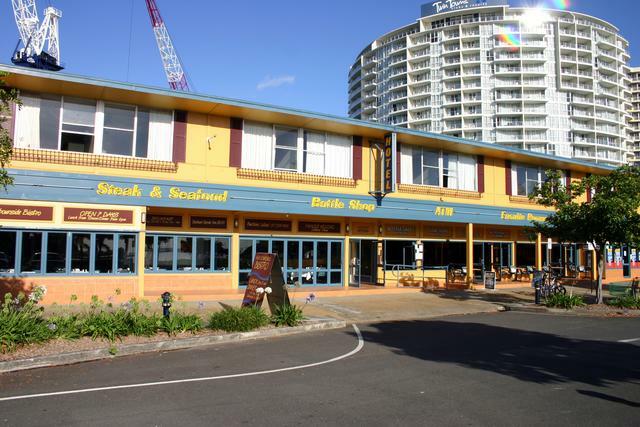 For mine I would like to have a really interesting answer for you, like a lesser known outback Pub somewhere on the border, but I would think it is the Dolphins Hotel in Tweed Heads. -28.1700865997 Lat A great Pub of course in its own right. Thanks for the feedback on the site. Much appreciated. Will let you know what other input we get from visitors to the site. Does anyone have a different thought on his? Cheers. In the 1860's my GG Grandfather had a lease on a hotel called The Huntmans Inn on opposite corner where Grace bros stood ..I did do a little research and found out when Grace Bros pulled it down it was called The Dollar Hotel. But on John Grahams site it says that the Landsdowne Hotel was pulled down and Grace Bros offered to build it on opposite corner in the deal .Can you tell me if this is right. Could you help with sorting this out. 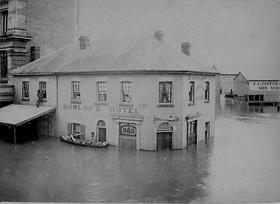 and built the new Lansdowne Hotel. I don’t know what the financial arrangements were. I will try to find out some more info for you. I have attached a photo of the old Lansdowne Hotel, taken on 15/10/1925. You have a great site, I have come across it a couple of times in my family history searches and really like the way you have set it out. 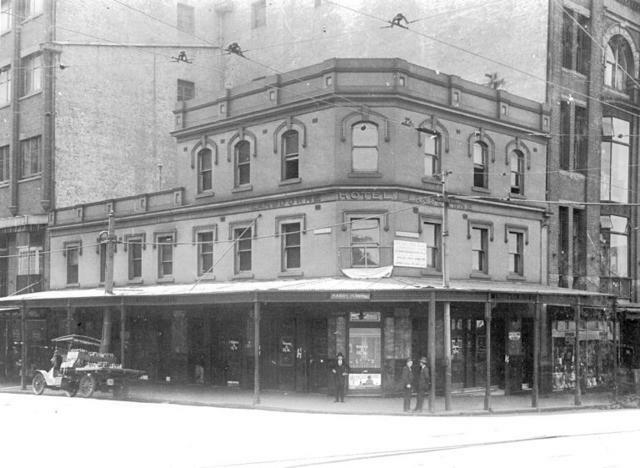 I am wondering if you knew if there had been a Hotel at 205 William Street Sydney around 1909. At the moment there is one called Hotel Formula 1,on 191-205 William Street but I am unable to find any history regarding it. My other interest is the former Rob Roy in Balmain, it seems to have had a very colourful past- my interest is around 1915. I’m doing some family history research and an ancestor that I am tracing was apparently declared insolvent as a licensed victualler of the Prince of Wales Hotel, Castelreagh Street in 1875-1876. (This is according to the State Records of NSW Insolvency Index). Her name was Rosanna Matilda Lawrence. I’m impressed with your site, but can’t find a Prince of Wales Hotel in Castlereagh St. Have seen the one in Newtown on your site, but this was not renamed until 1882. Can you help or any suggestions as to where I can look? I have had a look at the City of Sydney Archives but can't find a Prince of Wales Hotel in Castlereagh Street. There was one at 744 George Street in the 1950's. Thanks very much for looking and I now have kinda a bit more information. I got the married certificate of Roseanna Shearman today and on it it said that the man she married was Richard Samuel Lawrence (Sometimes spelt Laurence)and his occupation was Publican, also guess what Roseanna's father was William, occupation Publican. Maybe I can find something by tracing publicans for the 1860's, but how do I go about this. 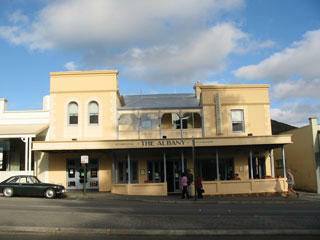 Hi, my name is Julie and I am looking for the Albion Hotel, Armidale. Are you able to tell me if it was renamed or destroyed or whatever? I am doing my family history and my grandfather lived in that hotel according to the 1930 electoral roll. I am curious to see what it looked like. I have a silver tankard engraved Belfields Hotel & am interested in trying to find out any history associated with it.I live in Hobart Tasmania & would appreciate any info you could give me.I had a great aunt who lived in Sydney for some time in the early 1930s & this is the only link I could imagine if this tankard did originate in Sydney. I don't know if there ever was a hotel of that name in Tasmania. 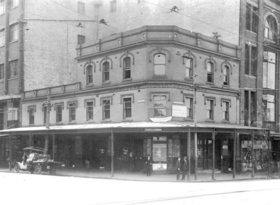 According to my information it was the Royal Hotel was on the corner of Hunter and Darby Streets, Newcastle. The hotel has been demolished and a Telstra building now occupies the site. Many thanks Jon for confirming what I suspected!! By the way, it had a lot of others stumped too! 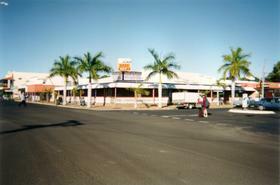 Another pub that has changed its name is the ‘Lucky Country’ on the corner of Hunter and Crown. I sense that in the 1950s it was called the Orient, but now I am not so sure. Any ideas? When I tell people that the ‘Civic Hotel’ was called ‘Stones Federal Hotel’, people scoff because there is also a ‘Federal Hotel’ up the road at the Auckland Street corner. I know that I am right when I say that it was originally ‘Stones Federal Hotel’, but it would be nice if you would confirm that for me. 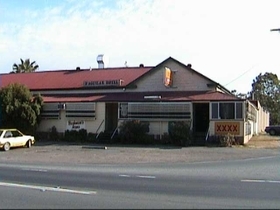 The Lucky Country Hotel, corner of Hunter and Crown Streets was recently closed by the Police (about October 30th 2008). The hotel was due to close about two weeks later but the Police closed the hotel earlier fearing a repeat of the Star Hotel riot. 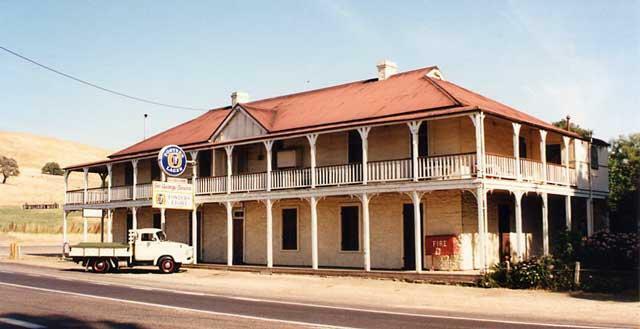 The Hotel was established c1925 as the Oxford Hotel, with a name change to the Tower Tavern c 1977. I have it listed in my 1990 Licencing Index as The Lucky Country. Also listed is Stones Federal Hotel, 417 Hunter Street. I hope that this information is of use to you and good luck with the book. 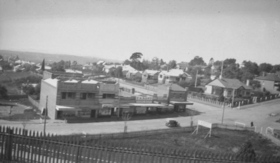 "......Cec came to Wagga Wagga and on 6 March 1939, with his wife Kathleen 'Kath' bought the lease of the Wagga Hotel (SE corner Baylis and Edward Streets). In 1941 he bought the freehold of the Australian Hotel, Fitzmaurice Street, and later bought the Advance Australia Hotel (east side of Baylis Street) from Henry McDonough, which he conducted under management. www.sodens.com.au/History2.html) . I know that is a different town, but not far south of Wagga. Anyway I spoke to Soden's (Josh) who put me onto a chap: Trevor Jones who manages the Home Tavern Hotel in Wagga. Trevor introduced me to the freehold owner of the Home Hotel: Dennis Wickham (69273015) who has owned the hotel for 18 years now, and knows most of the town. He knows the Advance Australia Hotel was well down south in Baylis Street, but unfortunately, it has been pulled down for many mnay years now. So you may have been amongst the last to enjoy its hospitality in 1972. So I hope this throws some light on your enquriy. Many thanks, it has been a great help and also very prompt reply. I never expected to hear anything this quick. I was afraid that demolition may have been the case as it was a very old, very basic hotel in those days (probably why we liked it), and I couldn't find anything in the whole length of the main street that looked familiar enough. I have just been reading your great site and noted the query re the "Advance" in Wagga Wagga, NSW. I lived at the hotel for a time in 1976, it was then run by an older couple Bill & May Stubbs who were most likely the last "mine hosts". It was before Sunday trading was introduced but had a very healthy Sunday "session" for those in the know. A great old pub it was knocked around 1978 to make way for a new Myer store which now stands on the site. 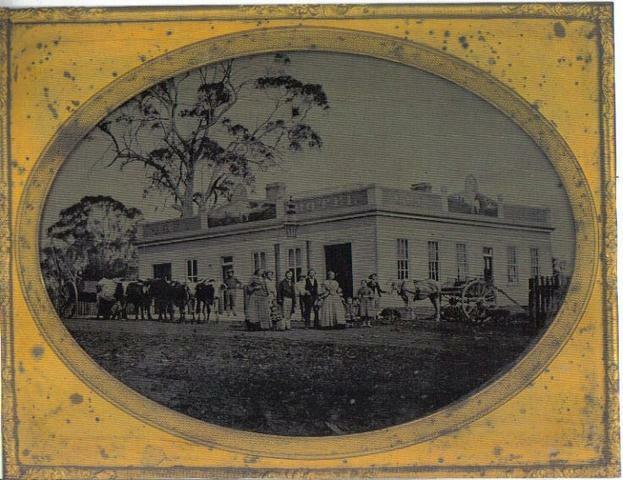 Hi, Found this Hotel in some old photos - I think this one was somewhere around Bathurst (I think this has been demolished. Would be great if any one could shed some light on this one. Photo: Courtesy "Orange and District – A History in Pictures"
A great site! but a question: Whatever happened to "The Station Hotel" in Orange? The 1936 Electoral Roll showed that my uncle worked there and since I haven't visited the area for many years I can't place it. Is it still in business and/or has it had a name change? And another thing where can I get a picture of it? Does anyone know? The Great Western Hotel is opposite the Rail Station so it may be a contender or the Pub may have gone. "According to a book I have, Orange and District – A History in Pictures the only hotel in Orange with Station in the name was the Station House Hotel. A scan of the hotel is attached. " -Many thanks Jon for your prompt reply and the attached pic of "The Station House" hotel......of course it was.. It couldn't have been much closer to the railway station. Perhaps that's where the first Stationmaster lived before his house was built. in the early 1900's . Could someone be kind enough to give further details re the Town Hall Hotel Balmain ( Corner of Darling and Montague st), if not where can I find further details. I would like to get details on when the hotel was built, was there a balcony attached when established, who established the hotel etc etc. 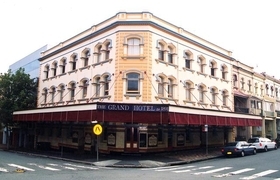 Established (opened) in 1879 as the Town Hall Hotel. 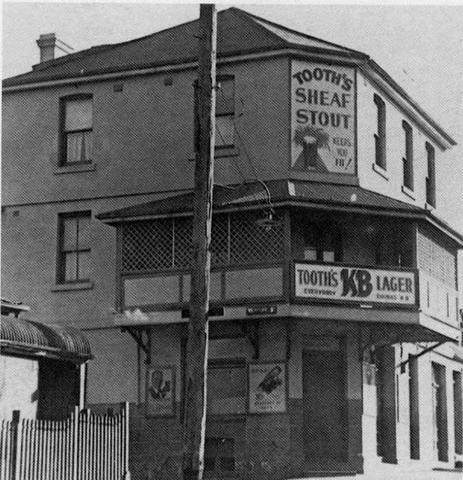 The original verandah was scrapped when the Town Hall Hotel was renovated in 1930.
cost of (Pounds) 10,160 following its purchase by Tooths Brewery in 1930. The licencee in 1887 was a George Miller. 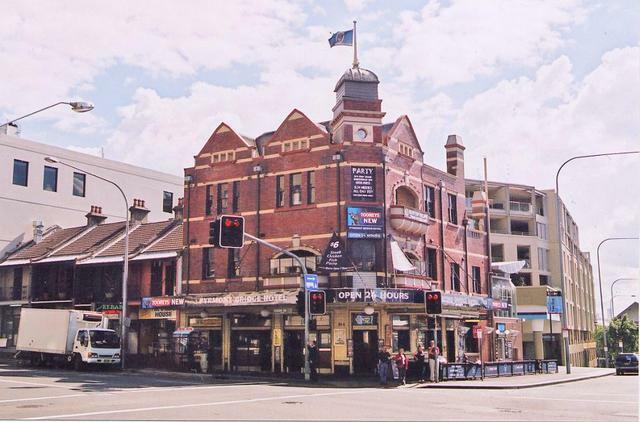 There was a pub in Hunter st Newcastle called the Blue Peter, not sure if the name was changed to Centenial,also A pub called the Empire hotel .in the west end now closed..and used as a squat. Also the Hunter hotel, opposite the old Strand picture show all these pubs where opened in the late 1970s now shut Also there was a pub on Newcastle beach called the Golden Sands not sure the year closed. 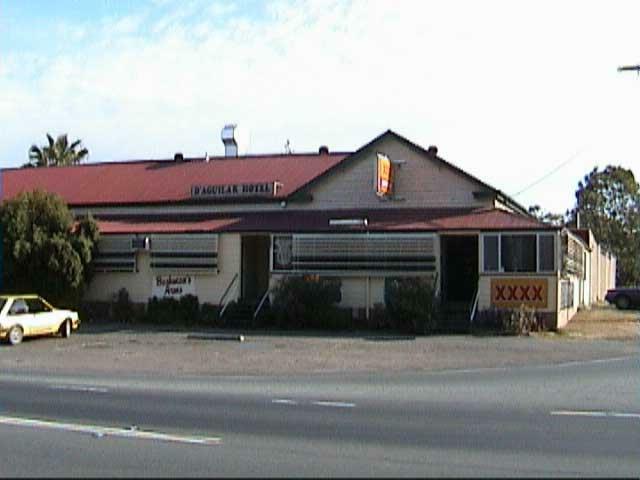 John been searching the net for a pub called The Bel Air hotel Situated at Kotara Nsw the year it closed. 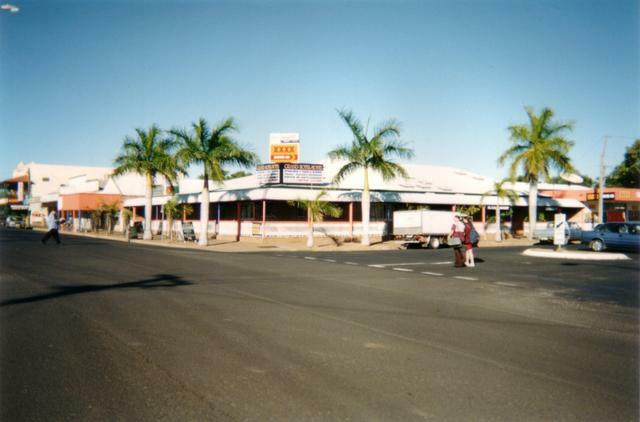 I think it was in the late 1980s early 90s A Tab And KFC fast food outlet took is place If some one knows would like to now the year . Sounds serious. The Table of Knowledge is on it like a fly on a picnic. Jon wants to know, do we get a cut on a winning result? Hi, I'm tracing my family tree and was told that relatives were inn keepers. Is there anyway of finding out what inns they had and where? I know that some of the inns they ran are no longer in existence as I'm talking about 1860's -1880's. From "Table of Knowledge" NSW rep, Jon Graham. I quote from the book, “Notes for Your Walking Tour of Historic Carcoar” written by Chris Dent. 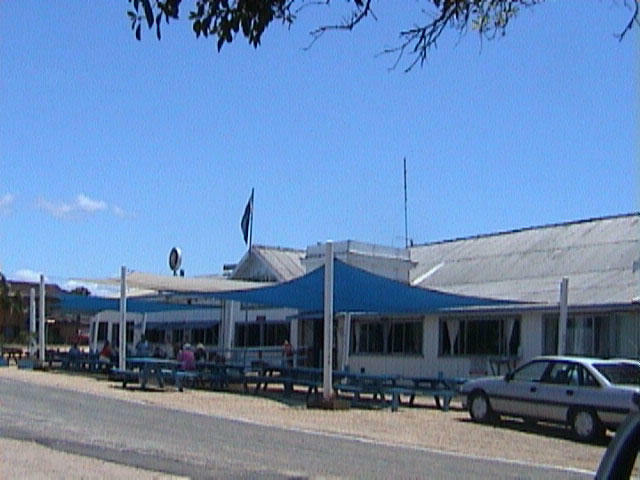 c1999 “Boxhall’s Inn”, “Court House Hotel”. built in 1870. Nowadays a private residence, the Hotel’s founding Licencee was James TANNER, who sold out to George BOXHALL in 1882. The hotel ceased trading in 1892. Many years ago I was in a Workers club in Sydney, which had the old stainless steel foot rest running along the base of the bar for the full length. The only difference to many bars with this was that it had water running in it. When I enquired why, I was told that in the old days the workers would come into the bar to knock back a few schooners in their lunch break and so as to not loose time going to the dunny would piss in the trough? The barman may have been taking the piss out of me but did tell me this was common throughout Australia once. I have retold the story to some Poms I am working with here in India and they think I am a wanker. Help, need some back up here?? That barman might have some old stories mixed up or possibly "taking the piss". Apparently in the days of the 6 o'clock swill when the bars were 10 deep, it was common for drinkers to piss at the bar so they didn't have to loose their space at the bar and go to the back of the mob. Certainly not a lunch time activity though. This is the Pub that she is talking about. I believe that it was called the Islington Hotel before being renamed the Parkview. I'm trying to dig up some info/history on the above pub as I lived there as a small boy with my parents who I believe were the publicans or owners? of the pub, around the early 50's. I also heard it burnt down many years ago. This is the only info I have on the pub. Maybe he could contact Richmond Council Library or Archives for more info. Kurrajong Heights Hotel Motel (Lic. No. 121873), 1349 Bells Line of Road, North Richmond NSW 2759 02 4567 7140 Rebuilt after a fire on the mid 1970's. I learnt that my Great-g-grandfather (Andrew Green) owned a hotel in Darlington named the Native Rose which was sold by the family in 1895. 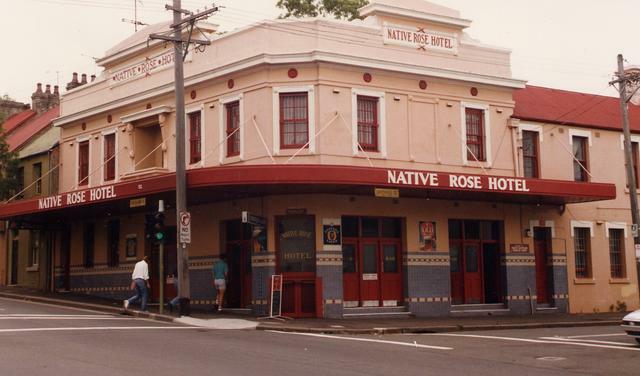 In all likelihood the present Rose hotel at 54 Cleveland Street, Chippendale (formerly Darlington) is on the site of the Native Rose. 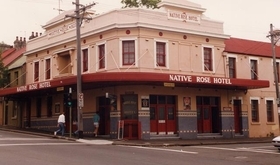 According to South Sydney Council records the Rose was built inter war circa 1923. Where can I obtain information on the original hotel, information on the licensee circa 1880 etc. Any information or photographs would be appreciated. I am doing a family tree and at the moment I am trying to get as much information from the past as possible. 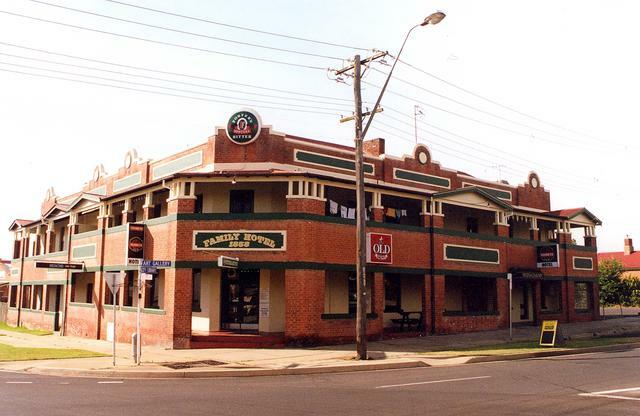 My great grandfather, James Murphy,lived in Bathurst and reputedly built and became the licensee of the Family Hotel. The date ties in with the information I have. Would you have any history of the hotel and its licensee's. He was married to an Ann Malcolm and afterwards to my great grandmother, Prudence. Any information you can send me would be greatly appreciated. 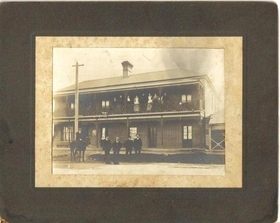 To Rae Casey, re the Family Hotel, Bathurst NSW 2795. Publican James Murphy. The hotel was established in 1858. I am currently researching Newcastle Pubs for a future book. 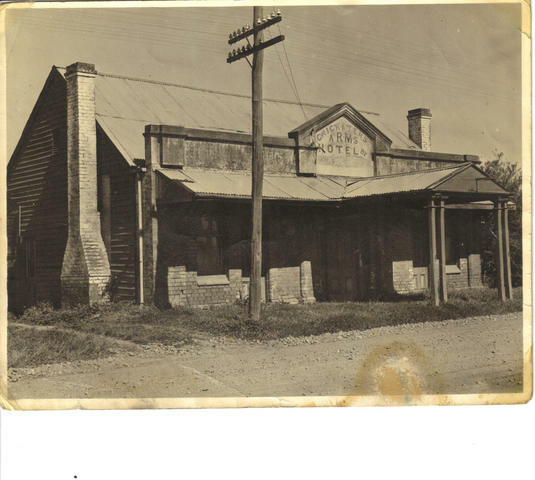 I am currently researching my father's family and have just found out that his Grandfather, "Ted" Edward Taylor and his three sons apparently built the Torrington Pub in Torrington, NSW. Family member confirms the Pub was still standing circa 1989 to 1993. Ed. We think the Former Torrington Hotel is the only Pub it could be but may find out differently If someone remembers another. Photo 1999 from Jon Graham. Horse and Jockey Hotel - Parramatta Rd Homebush, Looking for earlier pics of the Hotel? Ed. The hotel I'm searching for is the Halfway House Hotel/Inn at Homebush on Parramatta Road. Originally opened by Edward Powell in 1810, visited by Gov Lachlan Macquarie in his journals. Old maps show the hotel was moved and re-built next door to the original Inn in the 1880's. Three stages of this pub. Originally built by Edward Powell as the Halfway House Hotel in 1810. Rented for a number of years as a private residence after Powell's death. In the 1840's re-opened by an ex-convict James Kerwin who was known as Jimmy (Jemmy) the Jockey. He changed the name of the original building to the Horse & Jockey. Kerwin died in the mid 1850's. The original pub probably went through re-builds before the sub-division of the land in the 1880's. The old pub knocked down and a new pub of the same name built next door. I have a wonderful pic of Horse & Jockey 2, in 1902. Then that pub suffered a fire and was re-built in Art Decco style in the 1920's as it is now still trading. The original pub was a landmark between Parramatta & Sydney and mentioned many times in old journals as a place of bushranger attacks nearby and yet a safe stopover yet no descriptions of it has been found so far. It survived into the late 1870's and was probably re-built through this time from a humble Inn before being scrapped and re-built next door where it is now. I'm probably clutching at straws through my research finding a depiction of the pub in any of it's stages from 1810 to 1870 yet I am trying. Hi,I came across this question on your site when googling a game at Woodstock Hotel: Anyway I found a pic of the game in the odd chance that you may still have Tara’s contact details. See attached. Hi Guys, i've just stumbled onto your website and i have to say, well done lads. I was wondering if you could help me get a photo of a game thats on the wall of the royal hotel in woodstock NSW. I was driving through Woodstock a couple years ago and decided to spend the afternoon at the royal hotel which turned out to be one of the best afternoons i've ever had the beer was cold, there was no waiting for service, friendly locals and there was a unique old game on the wall. Its a box with a glass front and you put a twenty cent coin in the slot, it rolls down these angled ramps with gaps in them and the aim is to tap the coin hard enough to get past the gaps to the other side without losing your coin. it was one of those simple but entertaing games that you can play over and over. i've recently tried to find something similar but i've had no luck. i've searched the web and found nothing had a good look at all number of antique stores and come up empty every time. So i've come to the conclusion that i'll just have to make one myself to put in my bar. you guys seem to be in touch with most of the out of the way pubs, when i typed in the royal hotel woodstock, yours was the only website that popped up. I know this probably isn't a typical sort of request but I'd be really stoked if you could help me out. Family folklore has it that my Great grandmother had hotels in Pyrmont/Ultimo and Darlington. She was married several times, so her name would have been Margaret Murray, Margaret Naughton or Margaret Harris. Is anyone able to help with the names and addresses of her pubs? With regard to the pub connection, the name Margaret Harris could ring a bell. 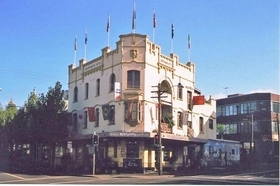 The Quarryman's Arms Hotel was built by George Harris who owned land in Pyrmont and was the Mayor of Sydney at one time. Harris Street, Pyrmont is named after him. This info is off the top of my head. Courtesy City of Sydney Archives. It was on the corner of Miller st and Bank st ,Blackwattle bay ,we called it the Wedge as it was triangular shape , near the cement wharf ,we used to tie up there in the late 60s/70s. Gratefull for any help Regards Paul. 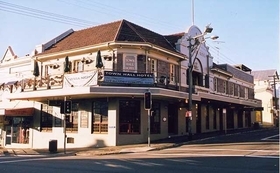 Attached is the only photo of the Halfway House Hotel, Corner of Miller and Bank Streets, Pyrmont NSW 2009 that I can find at the moment. I have had quite a few beers in the pub and, of course, it was an early opener. It was known for the annual thong clapping competition that was held there. 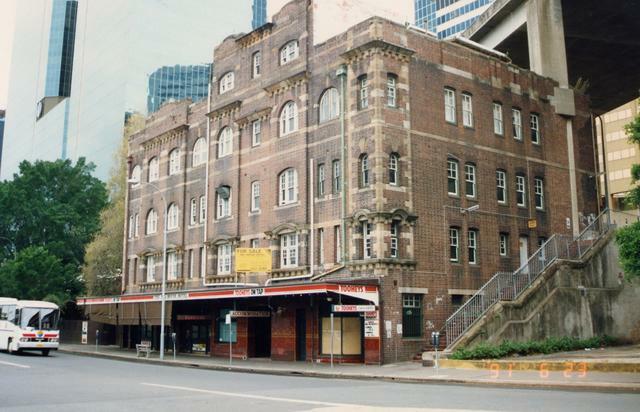 The pub was demolished in the 1980-1990’s for the building of the Anzac Bridge. Miller Street, looking west from Harris Street. In the foreground terraces 81-105 Miller Street, Swadling & Sons, Timber Merchants, In the background Halfway House Hotel left and the Silo right. Photo date 09/05/1955. Aka First and Last Hotel It was the first pub when you were travelling into the city and last one when you were travelling west. Thank you for all your help with this matter, I have had a few in the Half house as well my ship MV BURWAH used to tie up opposite the pub at the cement wharf . again many thanks as you have put my mind at rest . Paul. Photo: Can you identify this Hotel? Let us know. Going through old photos of my Grandmothers and found this picture of a hotel. Most of the hotels my relatives had photos of we knew the names off but this one has us mystified. My grandfather was the licence of the Breadalbane Hotel NSW and his sister and brother-in-law have the licence to the Binalong Hotel NSW in the 1920's. 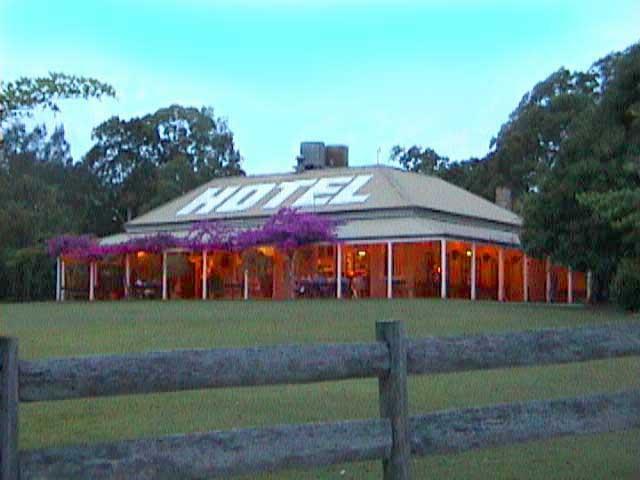 They also had the licence to the Family Hotel at Rydalmere NSW also the Emu Inn at Chippendale/. The family name is Loomes. How do I find out exact years when they held the licences to the hotels or any other information they can be required on hotels. I'm attempting to find a photo of a pub (a Stagecoach Inn) in my local area before it was demolished and re-built next door to the original pub. This pic of Sharon's is interesting as branches of the Loomes family lived and died in my area. There is a slim chance that this old mysterious photo may be the pub/inn I'm seeking yet only slim. Judging from the low res shot on your website, the pic was taken around the 1880's as there is a telegraph pole in the shot. The dress of the ladies and gents, as well as a figure on horseback, suggest around 1870/1890. 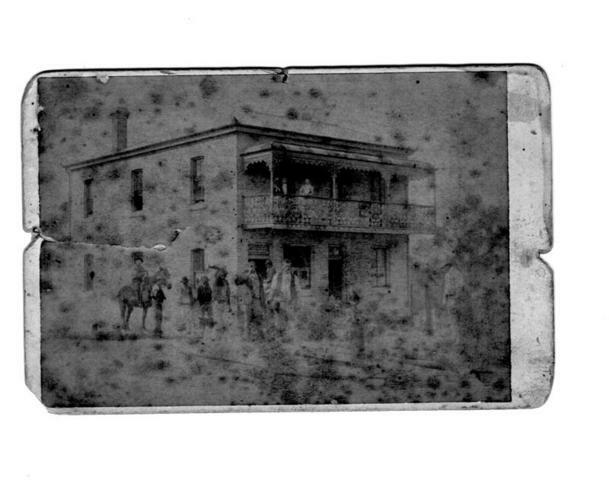 The Emu Inn, corner of Regent and Outram Streets, Chippendale NSW PD. c1913. The Licencee in 1913 was Alfred J. Loomes and the licencee before him was W.R. Loomes. The Emu Inn Pic 1913 submitted by Jon Graham. Pictures courtesy Council of the City of Sydney. The oldest Australian pub to stay in the hands of the one family? 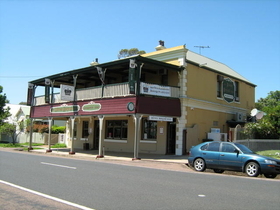 Was wondering whether or not you know if the Sir George Tavern in Jugiong, NSW, is the oldest pub to stay in the hands of one family, the Sheahan family. John Philip Sheahan built it in 1845 (rebuilt in 1852)and it has been run by Sheahan's ever since. Is there any other Pub which has been run by a family for longer than this? Thanks C.L. Cannot confirm but would be very surprised if there was an older continuous family holding, so its good to know about the St George in Jugiong. It is widely held to hold that honour and I and others in know believe it to be the case. The Tienans also confirmed it to me. Can confirm this much. None older in Qld. 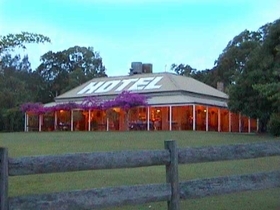 The oldest continuous family holding in Qld is the Tiernan family at the Australian Hotel in Murgon from 1912. The Tiernans have had this confirmed by Castlemaine Perkins as they have had no account in the same name from an earlier period. In NSW the oldest continuous license is the Surveyor General in Berrima from the early 1830's. Do not believe the Surveyor General has stayed in the same family and do not know of another continuous license dating pre 1845 so most likely the Sir George is the oldest family holding in NSW. That being the case it sounds like you are right about the Sir George Tavern in Jugiong for Australia wide. Not many Pubs in Victoria that could be older. Hope we can get a more definitive response from the "Matter of Fact" readers. I've been told that my ancestor was the first woman in New South Wales or Australia to hold a publican's licence. Her husband came out with the Second Fleet as a con but she was a free woman. The surname was Ezzy - I would like to know what the name of the pub, where it was and when she held the licence. I'm writing a honours thesis on pubs, here is an extract from my research in answer to MA Murgon of Queensland. 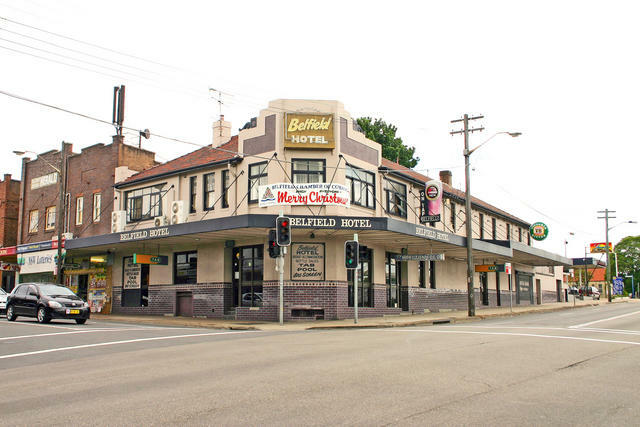 In 1792, the first liquor license in Australia was granted to publican Thomas Reilby, yet it is a little known fact that his hotel was actually run solely by his wife, Mary. It has become increasingly apparent through my research that Mary Reilby was one of many women in the colonial period to run a pub, yet it seems that these pioneering female publicans are less publicised than their male counterparts. In 1797 Sarah Bird was the first woman to receive a liquor license citing her own name, and by 1896 twelve of the 96 licenses in Australia were held by women. 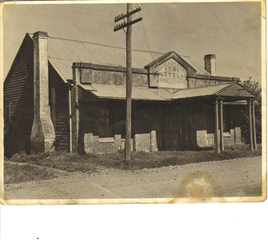 "I have attached a page from a booklet which I produced for Maitland & District Historical Society that contains a photo which is possibly the first “Volunteer.” This building was demolished in 1939 and a new Volunteer completed and opened in 1940. Thirty years later the hotel and the adjoining large premises of Cappers were destroyed by fire and subsequently demolished and the land cleared. 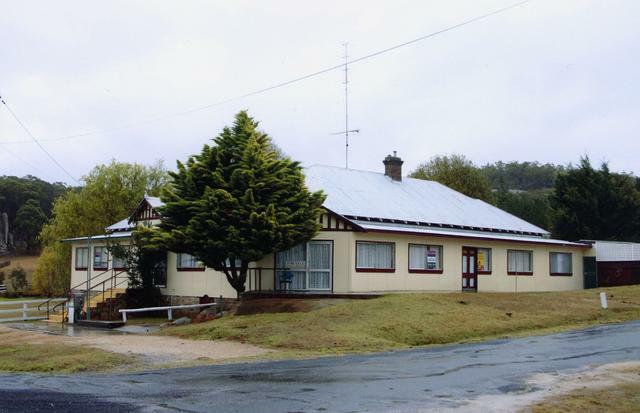 A building was later erected on the hotel site for the Hunter District Water Board." "Here's a poser for you, seeing you are a bit of a pub man. 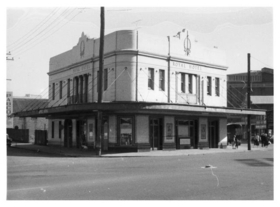 What was the name of the pub on the corner of High and Hunter St in Maitland that was destroyed by fire when the Cappers Building beside it burnt down in 1971? It was the "something" Steer Hotel. 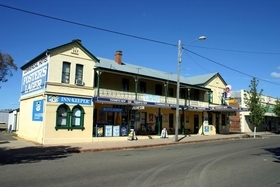 - Dennis"
Dennis, How about the "Volunteer Hotel" :-) previously known as the Governor Bourke. Pic above. "Great work mate, you are right. All I could see in a picture of the Maitland flood was half the word Volunteer with the N looking like an S so it looked like Steer but as soon as I read your email Volunteer clicked with my old memory bank. Great work mate, you are right. Thanks John"
Now worries, does anyone have a pic? Would anyone have a photo of the Grand Hotel prior to the new Grand Hotel being built. The old Grand Hotel is a link to my family history research. Photo: the current Grand Hotel. Operating in - 1896, 1897 to ? Operating in - 1873, 1874 to ? The publicans are ancestors of mine. Even recent photos (if the buildings are still standing) would be greatly appreciated. 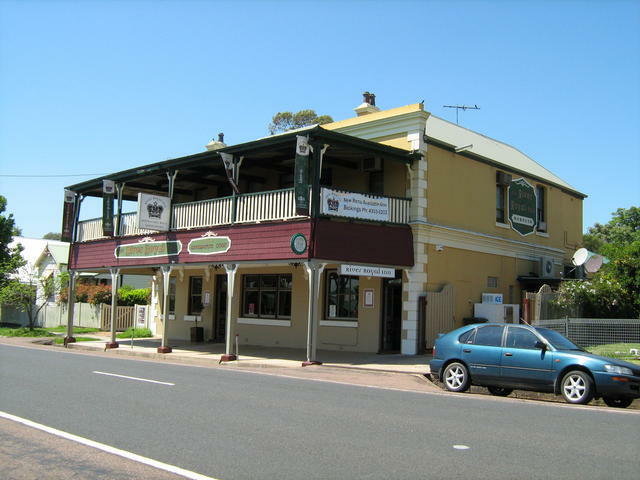 I have recently learnt that one of my relatives(great grandmother) owned a pub in Charleville QLD but not sure which one. Do you have information on previous owners of the hotels in Charleville?. Her name was Lavinia Eliza Wells (Crain)she was married to a Samuel Jacob Wells and they were in the Cunnamulla /Charleville area in 1890, my grandmother (Eleanor Maude Wells)was born in Cunnamulla in 1890. Ed- Can anyone assist please. 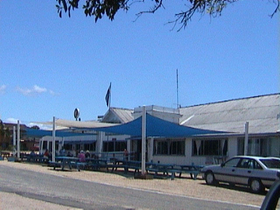 Appolonian Hotel, Boreen Point. 2nd oldest Qld license. Thanks A.W. Yep. Cabarlah is just north of Toowoomba. The Pub there is called the Farmers Arms. Will follow that up and confirm for you . Good to know the oldest contiguously licensed Pub in Qld. Still chasing confirmation on the Oriental being first Pub and also the name of the first Pub licensed under Qld as a new State. is a very good question. Crabbe from the Beauy Pub reckons the oldest Pub was the Oriental in Brisbane 1842. The oldest Pub after Queensland became a state in its own right is also of much debate. The Apollonian in Boreen Point seems to be the 2nd oldest Queensland license and it was moved there with the building from Gympie. It would make sense that the oldest should also be a Gympie Pub but that seems not to be the case as a lot of punters we have spoken too think that there was a Qld license issued before the eleven 1868 Gympie licenses and the Pub is somewhere near Ipswich. Any info on Queenslands oldest Pub and the first Pub after the split from NSW would be appreciated. Including Shanty Pubs. was brought by bullock team from Gympie to Waraba creek and then to it's current location at D'Aguilar. The question is what was the name of the Pub when it was in Gympie. Our research in Gympie while there says that all the pre 1900 Pubs are accounted for. An educated guess at the Bar is it may have been called the "St George" but that is just a guess. Dave and the Crew at the Bushy would love to know if anyone knows the answer. Photo: Unknown Hotel . What was its name? 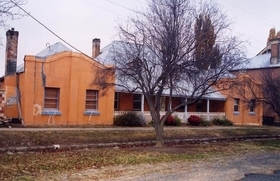 Red Lion Hotel - Dunolly, Victoria - My ancestor, Ellen Rebecca Crawn ( aka Croughan,Crahan,Chrahan,Chrawn,Crone,Craun), married Jeremiah Cullum on the 26 Jul 1872 at Dunolly, Victoria, and Jeremiah was the proprietor of the Red Lion Hotel in Dunolly. 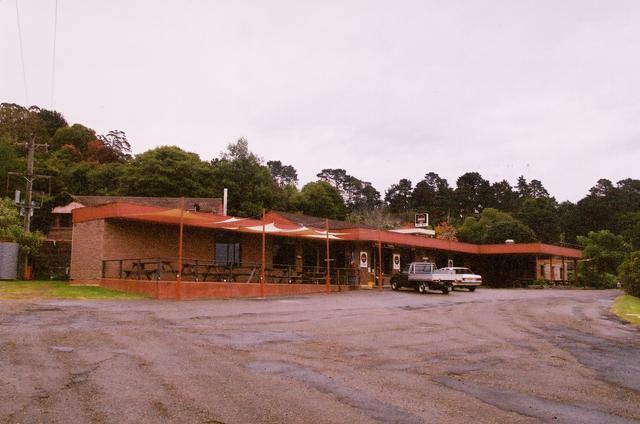 The Crown Inn - Pontville, Tasmania - Another ancestor, James Crawn (aka, as above) married Rebecca Cox in 1829, and they were the Licensees of the Crown Inn from the 8 Oct 1841 until James died in 1848 and I believe that Rebecca was the Licensee after this with help from Mary Crahan (nee Monks and aka as above) another ancestor. The Downs Hotel - Drayton, Queensland - My Grandfather, Kristian Isidor Efriam Engstrom was the Licensee of the Downs Hotel from sometime in 1937 until about 1939. (photo attached). - Robert"
In reference to the Red Lion Hotel in Dunolly, Tasmania. 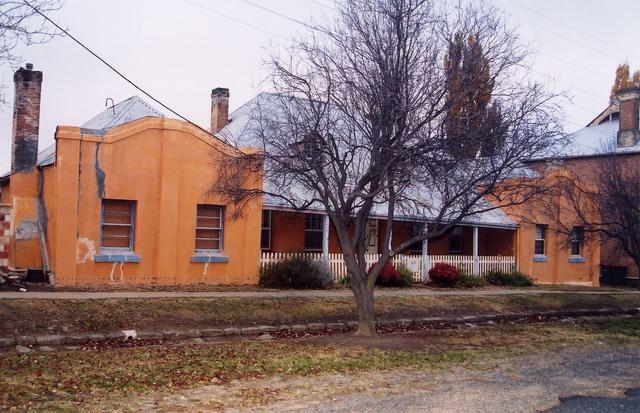 Jeremiah Cullum owned the Red Lion Hotel in Dunolly, VICTORIA. Jeremiah married Ellen Rebecca Crowan in his house in Dunolly, Vic. See attached Victorian Marriage Cert. No. 3270/1872. Ellen was born in Pontville, Tasmania not Calcutta as the marriage cert. shows. Jeremiah's sister Mary, was my Great Great Grandmother. If you would like further info re Jeremiah's ownership of the Red Lion in Dunolly, Victoria, let me know please. Starting with his birth in 1833 at Alderton, Suffolk and death from heatstroke in 1906 at Wilcannia, N.S.W. Jeremiah Cullum is a long story with three wives and their descendants. 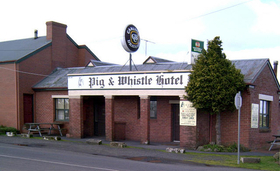 Hi, I am interested in researching the history of my local pub, The Pig & Whistle Hotel, East Trentham, Victoria. Where can I get some background information, for instance a list of former licensees, dates of building, licensing, etc? Photo:Grey Hotel Does anyone Know?? I am trying to find any information regarding a family photograph of "Grey Hotel". It is supposed to be in Victoria in the late 1800s. My great great grandparents Charles Harris is supposed to have owned it but I cannot find any trace of it It is a beautiful solid stone corner building, the family photo is in front of it with the bullock team. 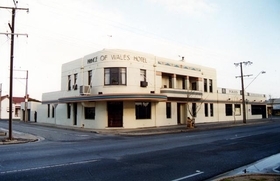 Just a little background information that I have is that the Harris family, having sold the "Grey Hotel" were moving to Tumut NSW to start up a coach run between Tumut, Wagga & Junee. My great great grandmother had sewn the money into the yoke of the bullock team in case they got held up by bushrangers. Sure enough they did on the trip over the border & she had kept a few shillings in her handkerchief just in case which she handed over to the bushranger & told him that it was all they had. The bushranger felt sorry for them & handed back the money plus a one pound note!! to help them along!! The Harris family was certainly shrewd or at least Granny was!! Hope this little yarn helps in locating the whereabouts of this forgotten hotel. Thanks G Getting close to an answer. Damn fine Question that one. Almost to the bottom of it. Lots of Grog shanties operated around Port Phillip in the 1830's. None remain as hotels as far as anyone can find out. So we look at licenses. 1836. The first three licenses were issued by magistrate Lonsdale. Means that if either of these exist under their original license they the oldest. 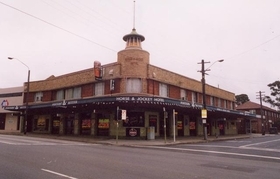 Port Phillip Hotel: We have no records of it still being around under any name but may well be. Governor Bourke Hotel: There is a Pub called the Elms Family Hotel which the owners say "started life in 1851 as the "Old Governor Bourke" making it one of Melbourne's oldest licensed houses." The owners have advised that The Elms Family Hotel wasoriginally the "Old Governor Bourke" (licensed in 1851). The "Governor Bourke" was further down Little Lonsadale Street between Spring and Exhibition Streets on the south side, which is now Telstra. Crown Hotel. Probably a bloody big Casino now. If that is the site of the original Crown Hotel and there is enough of the old Pub preserved in the complex structure then you could make a case for it being the still operating Crown Hotel. I know that the Crown Casino advertises an area with High Ceilings and Ornate timber work near a staicase, which sounds like an old Pub entry area.???? Still its a long bow to pull. So the only possible one there is maybe the Crown Casino. From Shane:I have just finished a crusade to visit 100 new pubs in a year. 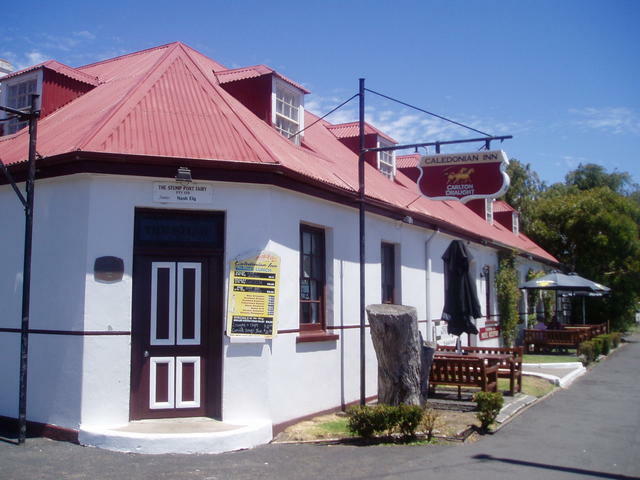 People tell me that the oldest pub in victoria is the Caledonian in Port Fairy. This pub is also known as "The Stump" and has been continuouslylicensed since 1843, and that should beat any existing pub in Victoria. are stumps poking up from the floor. Alot of the sheep shearers and bush workers used to stay there when in town. Yes thats the Royal. Its exactly the same as it ever was structually outside,but it has been painted. Also inside it looks very much the same the rooms have not changed much. indeed the washing arangements are still the same ie no en suite. There was an ablutions with showers outside on the veranda first floor.I was there in the early seventies and the rent as long term guest was $16 a week. I see from the web site they still do the long term deal. G'day, I am seeking history of Nimmo's Mile End Hotel, Adelaide, to settle an argument, When was it licensed and for how long?, I have 1 dozen engraved glasses. The Mile End (30 Henley Road Mile End) 0pened 1899 . This was however the second Mile End Hotel. The previous existed from 1840 to 1872. Hope that helps the arguement. I am in touch with a relative of Charles Robinson and she has recorded that he managed The Prince of Wales Hotel located at 215 Port Road, Queenstown from March 14 1894 until October 31 1894. The Prince of Wales still operates today under the same name. He also managed the Sussex Hotel located on the corner of Commercial Road and Canon Streets, Port Adelaide from October 3 1895 until February 12 1896. Hi Enjoyed your pub trail web site. My great grandfather Charles Robertson was a publican / licensee of a hotel in Port Adelaide from 1896. I do not know the name of the hotel. Do you know of a web site which records the names of Licensee or publicans for SA Hotels ? I don't know of a website, no. Might have to chase that up. If you are fortunate and get a researcher on side at the State library they might look it up for you. Keep in touch, I will chase down a db. Does anyone else now?? Hi, I was wondering you would able to assist my friend and me. 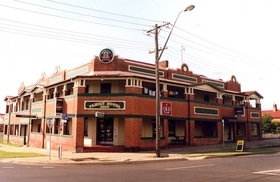 We have been searching and searching for the name of a pub that was around approximately 15 years ago, it was situated on East Terrace, Adelaide, South Australia. It was next to the Botanic gardens and had sporting memorabilia, you also could shoot hoops play golf and other sporting games. As we have searched the internet tirelessly and have come to nothing other than your site which was a lot more informative than the others we’ve tried rephrasing the search but still to no avail! That could be a few Pubs. If it is a still trading Pub it is possibly either the Botanic Bar or the Stag Hotel. Do either of those look familiar from the website? My name is Jo and I’m looking for a South Australian hotel once owned by my ancestors. His name was John Merritt and he was supposed to own/run a hotel called “The Grand JunctionThe Grand Junction”. In my investigations’ I’ve found a newspaper notice dated 17th Sept 1858 in “The South Australian Advertiser” which states that the license for the above name hotel was to be transferred to his wife Elizabeth Merritt. Jo, The grand Junction in Quorn opened 1883 so can't be that Hotel. Still looking. 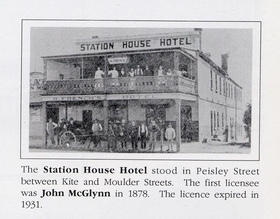 Do you know the oldest continuously licensed pub in Tas. Believe it's on the Tamar just North of Launceston. Couldn't find it on your site. Yep the Bush Inn (1825) has The Surveyor General by 10 years and any other Pub for that matter. Not really near Launceston though.